This is a photo of my Grandfather. I inherited this photo from my Grandmother after she died. It doesn’t have a date on it, but my Mom and I suspect that it probably dates to around 1942. 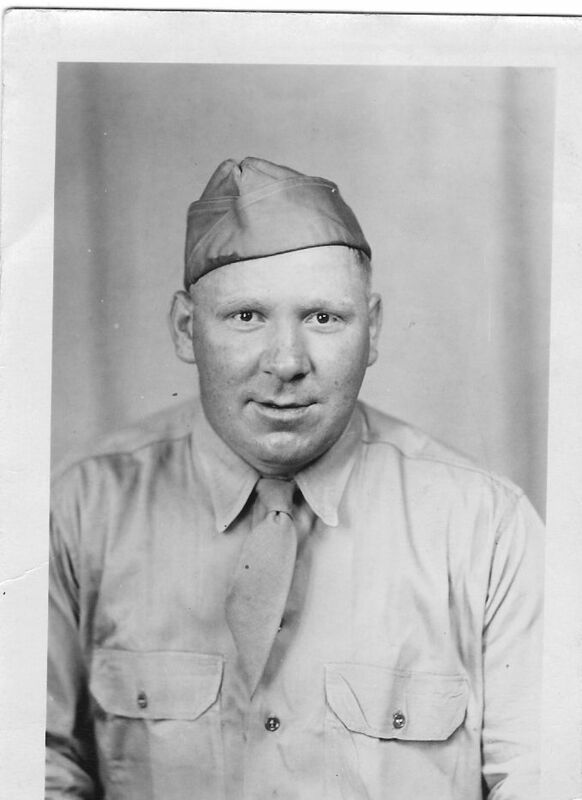 He was in the Navy at the time, during WWII, while my Grandmother was home with my newly born Aunt. My Grandfather was a cook on a Navy ship. Which seems insane considering that was the ONLY place he ever cooked in his life. At home, after the war, he did not even boil water. He left all the cooking up to my Grandmother. In fact, he seemed not to like food very much. When we lived with my grandparents for a short time in the 70’s we learned that each day of the week signified a certain entree, and that menu never varied. So if you weren’t up for creamed corned-beef on Saturdays, you were out of luck. Yes, a simple man indeed. This photo is how I remember my PopPop. 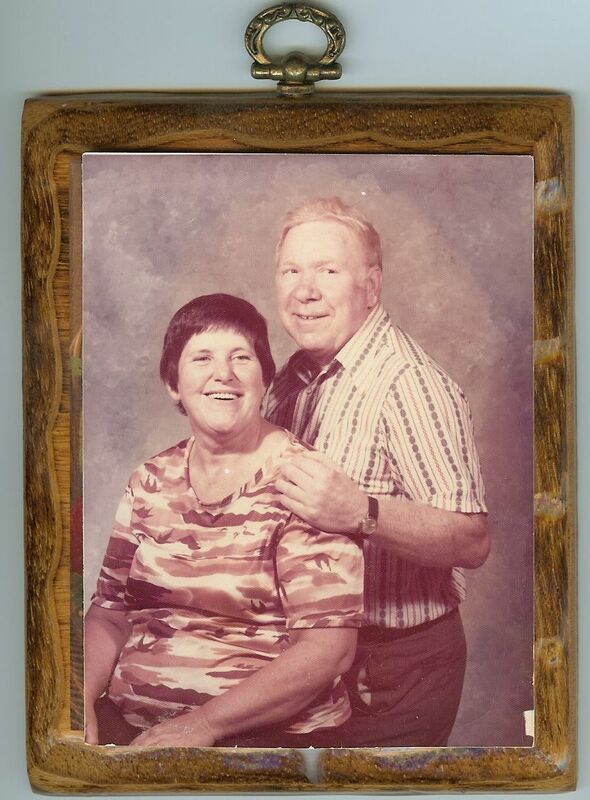 This picture of him and Gram was from the mid 70’s, and hung on Gram’s wall for 25 years. Nothing had changed much back then. The business was bigger, but he still ate hot dogs on Fridays. As a kid, I remember fondly riding along with him on errands in his beige pickup truck. It had a “pleather” bench seat, and he would drive down our street and make sharp turns which made me slide back and forth across the seat. I would giggle with wild abandon, pretending I was on a carnival ride. PopPop was fun, and how he loved being a grandfather. And then, suddenly in the middle of the night on a cold December evening in 1976, he had a massive heart attack. He died alone watching the 11pm news on TV. He was 61. I was 8 years old at the time, but I remember the sadness on my Mom and Gram’s faces for months. Things like that are hard to erase. My Grandmother was only 57 years old when he died. She didn’t know it then, but she would live a lifetime without him. My grandfather’s name was David. The name I passed on to my son. Looking at these pictures, I see David in both of them. And when he giggles he reminds me so much of my own childhood, filled with laughter and dreams to come. In many ways, I still feel like that 8 year old. There is still so much excitement that awaits. How the world has changed since 1976… I often wonder what PopPop would think of everything that came after him. He was right about the eating and **** thing though. And because of his visionary thinking, the construction company is still alive and well. what a great family story, thank you for sharing. those are some great photos too! I love family stories and family histories. Thank you. Such a lovely post to start my day off with. When I first pulled up this post and saw him, I thought ‘Oh my god! David totally looks like him!!’. I’m sure that he’s looking down on you and couldn’t be more proud of what you’ve become.